Meaningful use called and said, "The rumors of my death are greatly exaggerated." Seriously, a careful parsing of acting CMS Acting Administrator Andy Slavitt's comments at this year's J.P. Morgan Health Care Conference does not lead to the conclusion that meaningful use as a concept is over, but rather that it is being absorbed into Merit-based Incentive Payment System, and this will take some time to accomplish. As we head to Las Vegas for the annual HIMSS conference there will be a lot of discussion around changes to the EHR Incentive Program and a particular focus on the Merit-based Incentive Program (MIPS). There will be a keynote from HHS Secretary Sylvia Matthews Burwell, as well as sessions with leadership from CMS and the ONC - including CMS Acting Administrator Andy Slavitt and National Coordinator (and Acting Assistant Secretary for Health for HHS) Karen DeSalvo. You can find a helpful guide to all of the Government and Federal sessions HERE. Better understanding the implementation of MIPS and the implications and opportunities for health IT will be at the front of my agenda for the conference. On Oct. 6, 2015, CMS and the Office of the National Coordinator for Health IT released the final rules for Stage 3 of the EHR Incentive Program and the 2015 Edition Health IT Certification Criteria. Through this rulemaking, the agencies hoped to simplify requirements and add some new flexibilities for providers. They moved from fiscal year to calendar year reporting for all providers beginning in 2015, and they offered a 90-day reporting period for all providers in 2015, for new participants in 2016 and 2017, and for any provider moving to Stage 3 in 2017. They reduced the number of Stage 2 meaningful use objectives from 18 to 10 in 2015-2017, with no change in clinical quality measures. For Stage 3, there will be eight meaningful use objectives (with about 60% of them requiring interoperability). They also requested additional feedback about Stage 3 of the EHR Incentive Program going forward, in particular aligning with the Medicare Access and CHIP Reauthorization Act of 2015 (MACRA), which established the Merit-based Incentive Payment System (MIPS) and consolidates certain aspects of a number of quality measurement and federal incentive programs into one more efficient framework. They plan to use this feedback to inform future policy developments for the EHR Incentive Program, as well as consider it during rulemaking to implement MACRA, which is expected to be released in the spring of 2016. "The meaningful use program, as it has existed, will now be effectively over and replaced with something better. Since late last year we have been working side by side with physician organizations across many communities -- including with great advocacy from the [American Medical Association] -- and have listened to the needs and concerns of many. We will be putting out the details on this next stage over the next few months, but I will give you themes guiding our implementation. For one, the focus will move away from rewarding providers for the use of technology and towards the outcome they achieve with their patients. Third, one way to aid this is by leveling the technology playing field for start-ups and new entrants. We are requiring open APIs [so] the physician desktop can be opened up and move away from the lock that early EHR decisions placed on physician organizations [to] allow apps, analytic tools and connected technologies to get data in and out of an EHR securely. And finally, we are deadly serious about interoperability. We will begin initiatives in collaboration with physicians and consumers toward pointing technology to fill critical use cases like closing referral loops and engaging a patient in their care. And technology companies that look for ways to practice 'data blocking' in opposition to new regulations will find that it won't be tolerated." A careful parsing of his statement does not lead to the conclusion that meaningful use as a construct is over, rather that it is being absorbed into MIPS. The program is designed to shift Medicare reimbursement from fee-for-service to pay-for-performance. This next year will be very busy as the rules for implementing the program are released. Note that Mr. Slavitt said the meaningful use program as it has existed, will now be effectively over. But meaningful use as a means of measuring progress is still required to receive payments from CMS above the baseline under MIPS. There has been some frustration expressed by physician groups that meaningful use is slowing them down and ultimately not improving care. Many commenters have said that it is time to move beyond process measures and begin measuring outcomes. This requires new thinking and workflows. CMS and commercial payers have made strong commitments to move away from fee for service into paying for value. The technology foundation established through the meaningful use and other programs will help achieve these goals. Meaningful use of certified EHRs. Quality -- In addition to measures used in the existing quality performance programs (PQRS, VBM, meaningful use), HHS will develop additional measures. Resource Use -- The resource use category will include measures used in the current VBM program. Meaningful Use -- Certified health IT will be required in order to get credit in this category. Clinical Practice Improvement Activities -- Professionals will be assessed on their efforts to engage in clinical practice improvement activities. Incorporation of this new component gives credit to professionals working to improve their practices and facilitates future participation in alternative payment models. MACRA also eliminates penalties in the EHR Incentive Program after 2017 to be replaced by the payment structure for physicians within MIPS. And finally, on December 28, 2015 President Obama signed the Patient Access and Medicare Protection Act, which among other provisions provides flexibility in applying for a meaningful use hardship exception. This means that CMS no longer has to deal with the exemptions on a case-by-case basis. It also extends the timeframes to apply for an exception. According to the latest data from CMS almost 209,000 doctors and other health care providers will receive 2% cuts in their Medicare payments in 2016 for failing to meet meaningful use standards in 2014. Hardship exceptions will give relief and allow providers to pivot towards MIPS and alternative payment models. We may finally be reaching a tipping point in the transformation to paying for quality instead of quantity of care. There has been basic agreement among stakeholders that the EHR Incentive Program as it is currently constructed has achieved the goal of widespread EHR adoption, and laid a strong foundation for interoperability. The recent letter from 31 large health systems (posted on John Halamka's blog) to HHS Secretary Burwell asking them to reconsider Stage 3 Meaningful Use will apply additional pressure for change. Dr. Halamka will also be presenting in a HIMSS View From the Top session alongside athenahealth CEO Jonathan Bush - sure to be very interesting. The 2016 HIMSS Annual Conference & Exhibition is coming up between February 29 - March 4, 2016 in Las Vegas. This is the Super Bowl of health IT and will bring together over 40,000 health IT professionals, clinicians, executives and vendors from around the world. 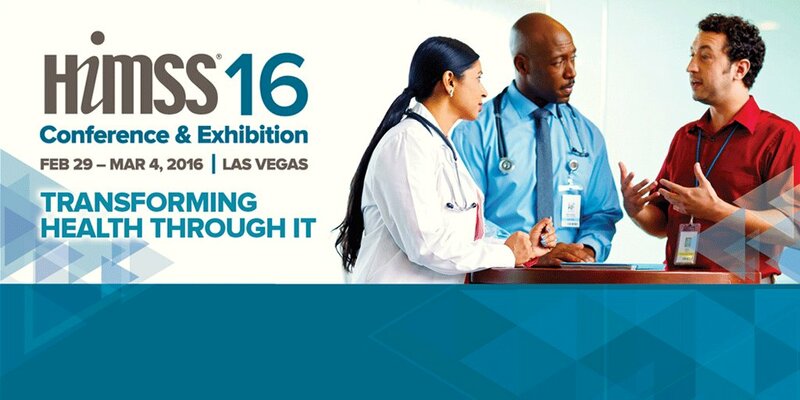 There are some great educational sessions, and the tradeshow floor will highlight the latest in health IT products. Some very interesting keynote addresses from Michael Dell, Sylvia Matthews Burwell, and even Peyton Manning (who has his own Super Bowl to contend with before the conference. With all of the changes in healthcare underway, this year's conference will be sure to keep CIO's and other decision makers in the loop as to what to expect over the next year. Having attended a few of these events in the past I can guarantee this will be worth the investment of time and resources. Also be sure to watch the Healthcare IT News website and Updates and Announcements from the HIMSS Conference website, as well as the king of content aggregators in the industry HIStalk. All of the SMA's have a powerful presence on social media and there is already a great deal of buzz for the upcoming event. Symplur provides social media analytics and shows that so far for the month of January the #HIMSS15 hashtag has almost 5,000 tweeters have joined in the conversation, with over 15,00 tweets and an amazing 91 million+ impressions on the web. So get ready Las Vegas, here we come!